The Curt deck chair comprises a fabric seat slung between two diagonal legs with anti-slip feet and simply leans against a wall like a ladder. The frame is made from local woods including ash and beech by people with mental or physical disabilities at the Altra workshop in Schaffhausen, Switzerland. 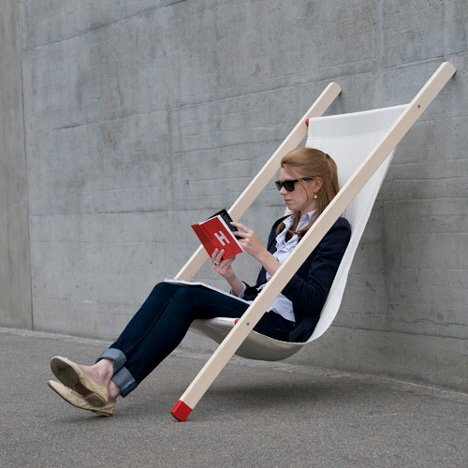 This deck chair is attractive in its simplicity. In combination with the environment it serve its purpose as a deck chair. To achive best stability, it needs to be leaned against walls or rails in a flat angle. The anti-slip coated stand provides safe grip on every surface. Even though it looks dangerous it provides comfort seating and relaxing in every occasion.